This is a 5 year old VCT garage floor that looks as new as the first coat of wax. Learning how to wax and maintain newly installed vinyl composite tile for the garage floor is important. It helps to protect the tiles from stains, damage, wear, and creates a nice polished finish. The process can also be confusing. With that in mind, we decided to list what is required and the steps involved in producing and maintaining a beautiful finish for your VCT garage floor. One note to make is that high traffic VCT floors do not have actual wax finishes applied anymore though the “wax” terminology is still popular to use. Most finishes now use water based acrylics that are much better than wax and are formulated for different purposes. The steps and products described below are similar to those used for high traffic commercial VCT floors. This type of finish is what should be applied to a VCT garage floor to insure the longest wearing and most durable finish. 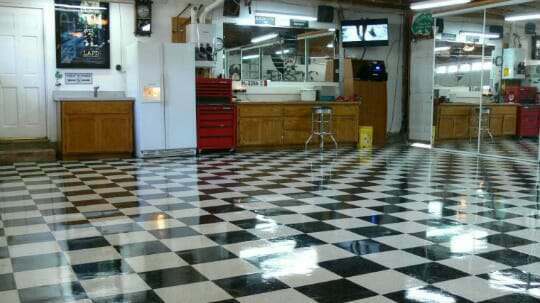 Remember, garage floors see much more than just foot traffic. They are subjected to vehicle tires and fluids as well as other contaminants that can be encountered in a garage. Though the floor may look clean after installation, it really isn’t. It may have foot prints, hand prints, dust, and glue residue around the seams or on the surface that all need to be removed. First, sweep or dust mop the tile to completely remove all dust and debris from the floor. Next, use a soft cloth and mineral spirits to remove any glue residue that may have squeezed up between the seams or tracked on the tile. on VCT and not string mops, but that is up to you. 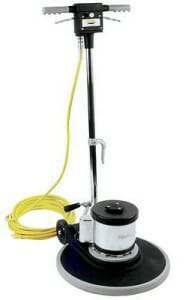 Be sure that you use a neutral cleaner designed for vinyl floors and use cool water in your mop bucket. Heavy duty cleaners can alter the pH balance at the surface and affect the adhesion properties of sealers as well as dull the final finish. Dip the mop in the properly diluted cleaning solution and wring it out well. Mop the entire floor this way making sure to rinse and wring out the mop frequently. Once done, go over the floor one more time with fresh clean water in the same manner. This will remove any residual film that may have been left by the cleaner. Let the floor dry completely before starting the next step. Note: One requirement that used to be standard procedure was to strip the tile of the temporary factory finish first before any sealers or finishes were applied. Most vinyl composition tile these days come with a factory finish that is compatible with most sealers and will not need to be removed. This includes Armstrong Tile. Always consult with the manufacturer first before you skip this step. This next step may come as a surprise to some people. Since the VCT you are putting a finish on is in the garage, you want to make it as resistant to oil stains and any other contaminants as possible. This is done by actually sealing the VCT first with a special acrylic sealer for tile. The VCT sealer is formulated differently and is designed to act as a base for the acrylic polish. Think of it as a primer. It penetrates into the pores of the tile, between the seams, and fills any low spots on the surface. This allows for the acrylic wax polish to adhere better which creates a more durable finish. It also helps to protect the tile from permanent marks or stains that may be caused from harsh chemicals or scratching through the finish.
. Stay away from the cheap $10 “do everything” sealer waxes for household floors. For application we recommend using a microfiber applicator mop pad and not a string mop. String mops always have a habit of leaving lint behind that gets trapped in the floor finish and they can be inconsistent with application. Microfiber applicator pads leave a smooth, glass like finish that goes on evenly.
. It will get the job done plus the replacement pads are cheap. The easiest way to apply the sealer is to pour it out directly onto the floor in a small ribbon at a back corner. Run your mop through it till it saturates the pad and then apply evenly in a side to side motion while walking across the floor. The coverage rate for sealers is high so don’t try to stretch it out. This is an example of using a microfiber applicator for applying sealer and wax. They are using a commercial applicator and bucket. Two coats of sealer is good. Be sure to let it dry before applying the second coat. This usually takes 15 to 30 minutes depending on temperature. Apply a minimum of 3 – 5 coats of the acrylic floor finishing wax in the same manner as the sealer. The multiple applications will provide for a thicker surface coat with the best finish and protection for the floor. It also allows for a thick enough finish to scrub the floor multiple times with a floor maintainer during the maintenance phase of the floor. Once done, your tile should have a nice bright and light reflective finish to the floor. If you want it to really shine, you have the option of buffing the floor with a floor maintainer to achieve an almost mirror finish. 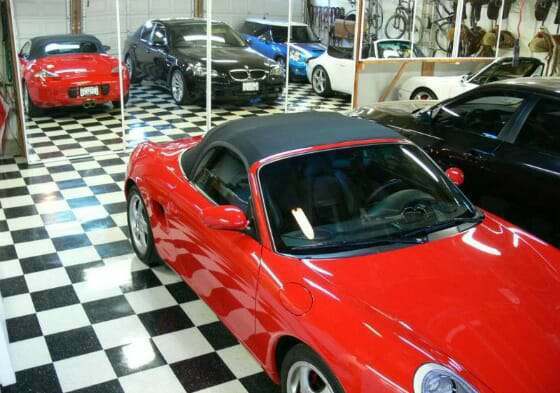 Maintaining your newly waxed garage floor isn’t difficult. We recommend using a dust mop fairly often to keep dirt and debris off the floor as needed. If you let the dirt build up it has the effect of sandpaper on the finish. It will create small scratches in the surface which will trap dirt and dull the appearance. For heavier cleaning, mop the floor occasionally with a neutral cleaning detergent for vinyl floors as described above and rinse with cold water. Do not let oils and other spills sit for long periods on the surface as it can eventually stain the finish or create a dull spot when you wipe it up. One option that we highly recommend is the use of a floor maintainer. These are the low speed buffers (175 RPM) that you can rent for around $40 a day or better yet, you can get great deals when buying these used. Floor maintainers serve multiple purposes in the maintenance of vinyl composite floors. One purpose for a floor maintaining machine is to create a glossier finish by spray buffing. This helps to bring out a more mirror like surface if you so desire. You can do this once the floor has been waxed and dried with its final coat. as an example. Use a white buffing pad for the floor maintainer and run the buffer over the tile in a side to side motion at least twice. Work your way across the floor in small 10 -20 sf² sections. This buffing will help to polish the surface and fill any microscopic scratches that may be present. There will eventually come a point when mopping the floor doesn’t bring back the shine and remove all the dirt. This is another reason for using a floor maintainer. Instead of the lengthy task of stripping the floor and refinishing, you can scrub it clean and buff back the shine instead. This is a two-step process with the floor maintainer. The first step is to attach a red (mild scrubbing) or blue pad (heavy scrubbing) to the floor maintainer. Using a neutral cleaner, apply a generous amount of the properly diluted solution onto the tile and slowly scrub it side to side with the floor maintainer. This process will remove a small layer of the acrylic wax and take the embedded and trapped dirt with it. Use a mop or wet vac to pick up the dirty residue as you go. Once done, use your mop to rinse the floor with clean cool water. Once the floor is dry, the second step is to attach a white buffing pad to the machine and spray buff the floor as before. This process with bring back the shine just as it was when new. One tip we can recommend after you scrub the floor clean is to apply another coat or two of acrylic floor polish before you spray buff. Since scrubbing the floor slowly removes layers of acrylic wax, adding a fresh coat helps to keep the layers built up and puts off the need to strip the floor completely. The time may one day come in a busy garage where scrubbing the floor clean just won’t remove all the embedded dirt and marks in the finish anymore because the layers of acrylic wax sealer has worn down close to the tile. This is when you need to strip the finish completely and reapply the multiple coats of acrylic sealer and polish. As you can see, this floor sees it’s share of vehicles. To strip the acrylic wax and sealers from the garage floor, you will need to use a blue or green (more aggressive) scrub pad on the floor maintainer. Do not use a black pad as these are too aggressive for VCT and could permanently damage the tile.
. Be sure to dilute the solution according to the instructions and slowly scrub the floor with the maintainer. Use a mop or wet vac with a floor attachment to pick up the dirty solution from the floor as you go. Reapply and scrub as necessary until all the wax is removed. After the tile is stripped it’s important to neutralize the floor. Use a commercial floor neutralizer when you do this. Do not use a vinegar and water solution as tests have shown this to be ineffective. Once neutralized, mop the floor one more time with cool clean water as a rinse. Once the floor has completely dried, you can begin the process of applying new coats of VCT acrylic sealer and acrylic floor wax.
. Sometimes known as a Doodle Bug, these are extremely helpful for scrubbing or stripping sections of tile that a floor maintainer cannot reach. They are also very good for scrubbing small areas of floor that may need it versus doing the entire floor. Be sure to get the threaded wood handle and brown scrub/strip pads to go with it. When using scrubbing and buffing pads with a floor maintainer, make sure to rinse them clean immediately with warm water after use and hang dry. This ensures that you can use them again and saves you from having to purchase new ones each time you scrub your floor. Do not set them aside and let the waxy solution dry out first before cleaning them. Another tip is to wear clean slip resistant shoes when applying wax sealers and maintaining your VCT garage floor. Dirty soles can leave marks and dirt that get trapped between layers of wax. And lastly, make sure to follow all safety precautions and directions when using cleaners, strippers, and sealers. This not only guarantees the most efficient use of the product and prevent time consuming errors; it ensures your safety as well. Following these methods to clean, seal, wax, and maintain your new VCT garage floor will provide for a finish that will shine and protect your vinyl composite tile floor for years. This is by far the best article I have seen in regards to VCT maintenance. I have been in the flooring industry for over 25 yrs. and this is spot on. I have seen many maintenance personnel damage the life of vct from stripping and over saturation of water/chemicals which they have deemed necessary which is far from the case. I have seen many floors have to be replaced before their time due to poor maintenance procedures, really refreshing to come across this article. Thank you for your review. I’m glad to know that a professional uses the same method. I am about to seal and polish my brand new VCT tile floor and was researching how exactly to do it. Your endorsement helps me trust the article. I wll be hyperaware of the over saturation issue. Can Zep high gloss polish be put over Mannington high gloss polish? I failed to mention I am polishing VCT tile. Hi Joseph. Yes, you can generally apply one brand over another. Just make sure the floor is clean before you do. As always, if ever in doubt, we recommend contacting the manufacturer if you ever have a question about compatibility with other products. I have a medical building that i clean it has very very high traffic i have been using the zep high traffic floor polish but it just dont keep its shine very long any suggestions? Hello Steve. The Zep High Traffic Floor Polish is actually a highly rated polish. We suggest contacting Zep and talk to them about your issue. They have a tech reps that can assist you with issue. Question about existing VCT floor. Recently purchased retirement lake home. Part of property included a large detached shop building with 300 sq ft office. Have done epoxy on main shop floor. Office has 12 year old VCT tiles. Two issues. Many years of ground in dirt and little or no maintenance by original owner. Secondly there is a traffic wear problem from office door across office to shop bathroom. No surprise there. Bought large amounts of baking soda and vinegar from a warehouse club. Using a strong bristle deck brush. Clean up going well. Confused about what steps to do next. I realize the traffic wear marks will never look great. I just want a serviceable floor short of removal of original tile and/or overlay with peel & stick tile. Since this initial cleaning 80% of tiles look great. Suggestions? Hello John. You did not mention stripping the VCT of all sealers and waxes as we discuss in the article. Have you done that? Stripping the VCT takes you right down to the tile and removes any ground in dirt and wear marks that are not in the tile itself. If you have done that and you still have traffic marks in the tile, sometimes a light sanding with 100-120 sandpaper will clean the tile up.